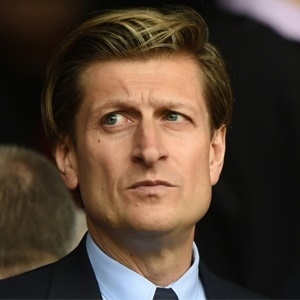 Cape Town - Crystal Palace chairman Steve Parish refuses to apologise for the risk he took by bringing in Frank de Boer as manager ahead of the 2016/17 Premier League season. De Boer only had four league games in charge of the Eagles, and after losing all of them he was sacked, giving way to Roy Hodgson to take over at Selhurst Park. The decision to bring in De Boer was motivated by the idea that he could transform their playing style into a more possession-based approach, but with limited time at his disposal the former Ajax boss was unable to implement his philosophy. Critics felt the decision to hire the Dutchman and then not allow him time to adjust to the Premier League was ill-considered. However, Parish doesn't believe he owes anyone an apology for taking the risk. "As a club we got it wrong and as a chairman I got it wrong with Frank," Parish told Holmesdale Radio. "But I am never going to apologise for taking a risk and trying to improve this club. "If I make mistakes in doing it, then I will hold my hands up. But I am not going to apologise. The road to hell is sometimes paved with good intentions. "I can understand people thinking four games is not enough but results were not good. Frank was here from July 1 and in the end I did not think it was going to work. "It could have gone on longer but if that then produced the outcome I thought it was going to, then that makes me negligent."